Quercitin benefits are primarily about its ability to support mitochondrial biogenesis. Quercitin can promote the creation of new mitochondria and thus support the cellular energy process in your body. Yes, all that complicated word means is that your body has the ability to create new mitochondria, just like replacing old cells. Mitochondria are what make the energy in the cells of your body, and when you get new ones, you get more energy! Quercitin is a natural bioflavonoid along with PQQ is one of a class of nutrients called “bioenergetics,” because they play a direct role in the cellular energy process. This process takes place in a special part of each of your cells called the mitochondria. Think of mitochondria as a kind of battery like a fuel cell, which takes the bioenergetic nutrients and through chemical reactions creates electricity which then powers your body. This nutrient has multiple benefits in addition to its role as a bioenergetic nutrient and promoter of mitochondrial biogenesis. Berries like blueberries, bilberries and blackberries. Be sure to include plenty of these fresh fruits and vegetables as well as olive oil and tea. Please note: Red wine in moderation is also an option as well. If you do drink wine, do not overdo it! Also, stick to organic wines as they do not contain sulfates. 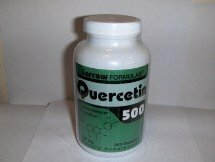 The supplement form of quercitin comes in capsules usually 200-600mg, or sometimes included in a formula with other nutrients. Start with diet first, then add the supplement form if you are addressing a problem that has been identified by your antiaging physician. Brand wise, I like Jarrow Formulas, as Life Extension has selected the Jarrow product for sale on their website. That's about the best recommendation you can get! You can get this product from the Vitamin Shoppe. mitochondrial biogenesis, which is now known to be absolutely critical for preventing chronic disease and promoting longevity. You now have another potent weapon in your arsenal of natural disease fighting agents. You will be hearing a lot more about this amazing nutrient in the years to come!